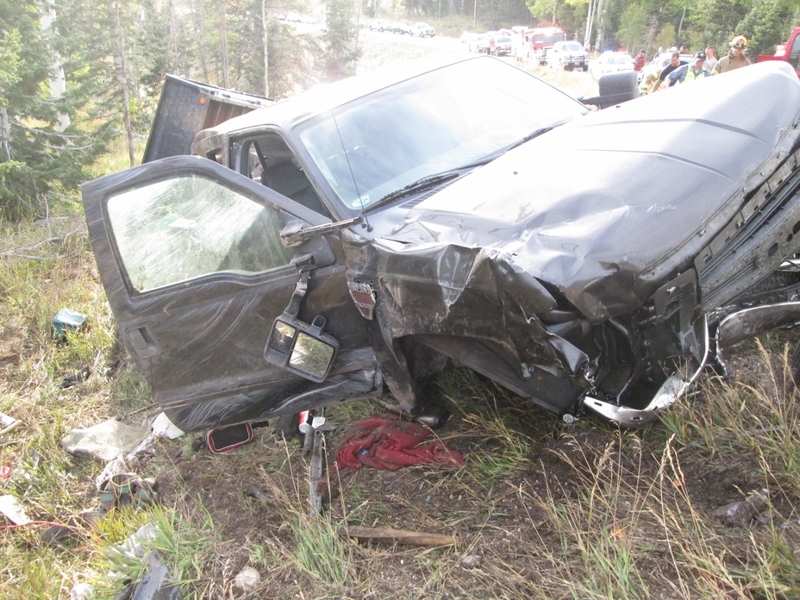 IRON COUNTY – Two children were flown to the hospital Friday after the vehicle they were traveling in was struck head-on. At approximately 5:20 p.m., a Ford F-350 pickup truck was pulling a trailer on state Route 14 in Iron County between mileposts 13 and 14 when the trailer began to swerve, according to a statement from the Utah Highway Patrol. The swerving may have been “a result of speeds too fast for the canyon road,” the statement said. The driver of the F-350 lost control of the truck due to the trailer’s movement and the truck crossed the center line, colliding head-on with an oncoming Chevy Avalanche. Both vehicles then slid off the road and down a 30-foot embankment, according to the statement. Two children who were passengers in the Chevy, ages 10 and 11, were taken by Life Flight to an unspecified hospital with serious injuries. The Chevy’s three other occupants were taken by ambulance to Valley View Medical Center in Cedar City, according to the statement. No one else was reported injured. This report is based on preliminary information provided by responders and may not contain the full scope of findings. A lower speed limit needs to be set for vehicles towing trailers. Utahans seem to drive at least 10 mph over the limit anyway despite road, weather or any unsafe condition. And take advantage of their pets and livestock! Crash news is always more heartbreaking when children are hurt . Prayers for their speedy recovery . Koolaid needs to be regulated for the stupid things they say. Koolaid seems to have the mentality 10 points lower than a slow learner therefore placing them in the retarded section of the class.